We have boat dock spuds and a loop for your boat docks. The boat dock spuds will flex and give some. We have different lengths for your boat dock spuds. The boat dock spuds come indifferent sizes: 3'', 4'', and 6''. The spuds also come in different colors: Green and Brown. 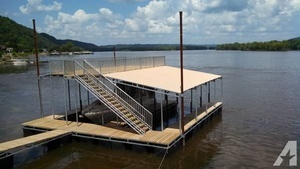 Option: 13% Chrome Steel or Fiberglass boat dock spuds.